Michael (check his blog Tome Raider. Awesome name btw!!) is reviewing the 3rd installment of the UF/Paranormal/Sci-Fi series Valducan, on the blog ! Happy reading and happy weekend, y’all ! I feel like I’m repeating myself way too much when I say this, but I wouldn’t say it if it wasn’t true; Skorkowsky’s writing just keeps getting better and better and better with each book! This one was so much different than it’s former two books. In the first two we’re pretty much just following one hunter in first person POV. But in Ibenus, we have 3 different POV’s that we’re following. Allan, the wielder of Ibenus; Victoria, a former police detective; and Gerhard, a new member of the Valducans and wielder of Umatri. I’m not really sure how to describe the plot without spoilers, so I’ll just drop the description that the book gives on the back cover. After surviving a demon attack, disgraced police detective Victoria Martin tracks down the Valducans in search for answers. Recognizing her potential, and despite the warnings of the other knights, Allan Havlock, protector of Ibenus, takes her in as his apprentice. As the Valducans travel to Paris to destroy a demon nest infesting the catacombs, the knights find themselves hunted by an Internet group intent on exposing them. Victoria, who belongs to this group, must desperately play both sides to not only protect herself, but Allan, whom she has begun to love. 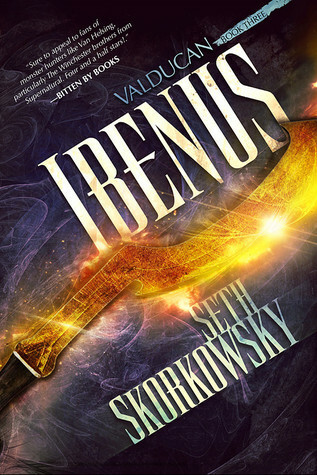 Ibenus, however, has other plans. One of the coolest elements of the book, in my opinion, was Gerhard’s story line. We finally get to see a first hand account of a hunter bonding to his weapon. We’re told about what it’s like quite a few times in the last 2 books, but it just doesn’t hit home quite the same as being in the head of a hunter while he’s bonding. Allan and Victoria’s story line were really fun, as well, but I definitely enjoyed Gerhard the most. Victoria’s got really interesting after about the midway point, but I can’t really say why. Spoilers, ya know? What I can say is that Victoria had some really great development throughout the book. Honestly, I thought she was kind of annoying, at first (not due to bad writing, though) but she ends up becoming a character I was actively rooting for. Allan is a character that has been around since book one and was one of the first characters I liked. So I really liked getting to be inside his head. The plot keeps about the same pace as the past two books. Pacing is another of the things that I think Skorkowsky excels. He’s even able to keep the slower parts interesting, which is something that seems pretty tough to do. I’m not all that picky about the pacing, especially when we get such great characters, but it’s so nice to get a well paced story along with the kinds of characters we get in these books. Another thing I really enjoy about this series is the settings he chooses. I’m not at all interested in Paris, but I really loved the catacombs. I’ve never been there personally, but it was the perfect setting for the vibe that these books give. I mean, there aren’t many places more creepy than an abandoned underground network that has walls lined with skulls. I’m not sure if the author has ever been to the catacombs, but he really gave us some vivid descriptions. If his descriptions are mostly made up, he did an incredible job of making it all seem so real. I honestly can’t believe how much better each book gets. Just when I think he can’t get any better, he goes and proves me wrong. Luckily the next book, Redemptor, drops November 1st. So not too long of a wait! I highly recommend picking these up by then. You won’t be disappointed!